Member William Duperouzel’s uncle, who was killed between 14th and 16th August 1916 at Mouquet Farm, served as a Private in the 51st Bn. AIF where 99 men died. Only 22 of them have a grave. 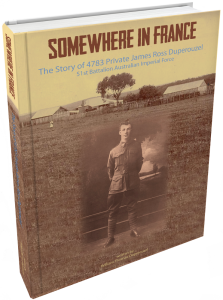 James Ross Duperouzel is one of the 77 men of his battalion with no known grave and this excellent book describes the search for an answer as to where his remains may be. The result is the most in-depth study of an individual casualty that I have seen, the book contains copies in colour of every record to have survived and it is interesting to notice how much more has been preserved in the archives of Australia than is likely to be available to his British counterparts. Add to this the detail in the war diaries and we have enough material to make this interesting history of one man during the war. It is very well presented with near perfect illustrations without the muddy images so often seen in memorial books. This novel approach based on CWG data uses other burial information to establish likely burial sites, yet his remains may still lie on the battlefield on which he fell. It is indeed a worthy memorial to James and his colleagues.